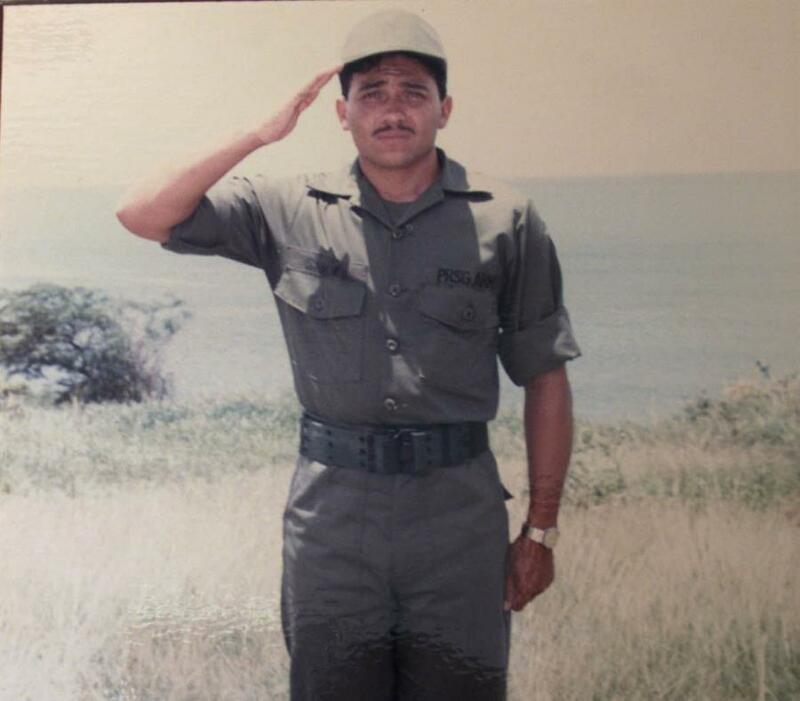 Editor's note: This is the first in a series of stories into Vieques 20 years after David Sanes' death, which marked the process of getting the Navy off the island. Vieques - Back when the U.S. Navy was brutally bombing the island, up to 200 days a year, no one seemed to be interested in a modest house in La Esperanza neighborhood that don Carmelo Rosa and doña Gabriela Ponce built with their own hands, they raised their children and have lived there since the 1950s. "Boy, when they bombed here, this was trembling like… you have no idea. There are a couple of cracked houses out there, what happens is that this one was built well enough," says don Carmelo, 82, a retired municipal employee, while fighting the heat on his terrace on a suffocating Sunday afternoon. It is a white, discreet and well-kept house that is on a hill at the end of the La Esperanza boardwalk in southern Vieques. There is a captivating view of the glittering sea, packed with sailboats, of Cayo Afuera and, a little further on, beyond the afternoon smoke, the infinite horizon. When bombings ended in 2003, people who had never been interested in an island living amid bombings, tremors and toxic winds started to find themselves attracted by this view. Since the Navy left, strange people would come to the house. From time to time, white men in dark glasses take pictures, notes, and measures. They are Americans. Some even knock on the door and politely ask, in English or in broken Spanish, if the house is for sale. When don Carmelo and doña Gabriela answer that they are not selling, they just leave. Don Carmelo and Doña Gabriela built the house with their own hands, brick by brick, on a lot the government gave them in 1950. They build it for their children, that now are 60, 59 and 58 years old. Carmelo simply does not know how much the house costs. "I have no idea, but they have paid a lot of money for houses out there," he replies. And he is right. According to different real state websites, houses in their neighborhood cost between $250,000 and $300,000. That is at least twice the price of a house like this in any other neighborhood in Puerto Rico, outside the metropolitan area. Although numbers are tempting, the couple stands firm. "I did not build this house to be sold but to live my whole life here," Carmelo reiterates. What happens to them is just an example of what has been happening in Vieques since the end of the bombings. When bombings ended, the island´s world-class beaches attracted a lot of people that are now interested in buying properties everywhere, which is changing its social fabric. Properties prices skyrocketed with the tourism boom. Americans have established high-end hotels and restaurants, where Viequenses, who remain poor, have no access. In areas such as La Esperanza boardwalk, steps away from the home of don Carmelo and doña Gabriela, the main tourist meeting point, Viequenses are barely seen. Here, American residents doubled between 2000 and 2010, according to the U.S. Census Bureau. While in 2000, the census counted 422 Americans on the island; in 2017, the American Community Survey estimated them at 900. At the same time, the number of Puerto Ricans here, as on the rest of the island, has declined. In 2000, there were 8,660; in 2010, there were 8,602. The 2017 estimate says there are 8,528 Puerto Ricans in Vieques today. These statistics indicate that the population coming from the mainland here was 5 percent in 2000, 7 percent in 2010 and 10 percent today. In short, since the Navy left, the number has raised by 113 percent, while that of Puerto Ricans has dropped by 2 percent. This pattern, according to multiple interviewees, reflects the "gentrification" phenomenon here, which is what happens when the value in certain geographical areas grows abruptly and its original inhabitants are displaced by people with greater purchasing power. According to experts, there is also a population displacement in Vieques, since the number of natural residents is decreasing, while the number of foreigners is growing. It is something that has happened and is happening in other areas of the island, such as Santurce and Old San Juan. But Vieques shows the most abrupt change. From a broader perspective, it is a very disappointing outcome for Viequenses who fought for decades against the Navy and, when it left, others benefited. "Since the Navy left, many properties have been sold to foreigners. You can see that even Navy´s land and iconic places, like Mount Carmel and Bravos de Boston, now have a large U.S. population," says Yarimar Bonilla, an anthropologist at Rutgers University in New Jersey, who has studied Vieques in depth. "I was worried that this might happen," says Robert Rabin, an American who has lived here for 40 years, and was one of the leaders of the anti-Navy campaign. This April 19 marks the 20th anniversary of the accidental bombing that killed David Sanes, a civilian Navy guard at Camp García observation tower. That death shocked Puerto Rico and gave way to the campaign that four years later got the Navy off the island. El Nuevo Día toured around the island 20 years after that defining event. Transformation is clear everywhere. In some areas, like La Esperanza, people speak more English than Spanish. There are no viequenses-owned businesses in the area by, except for La Nasa bar, which was destroyed by Hurricane María in 2017 and now only opens at weekends. Businesses in Isabel II, the urban center of the island, are often full of tourists. Neighborhoods are full of hostels. There are now more than 100 hotels and dozens of short-term rental residences on the island. When the Navy was here, there were no more than 20 hotels. Between 2011 and 2017, Vieques sold an average of 44,136 hotel rooms a year. Hurricane María stopped the flow of tourists until well into 2018. But by 2019 it went back to normal. Viequenses complain that tourism does not benefit them. There are jobs, but in not well-paid ones, since Viequenses, like the rest of Puerto Ricans, barely speak English. Mayor Víctor Emeric says the tax per room in Vieques generates about $2 million a year. But the municipality gets nothing. "Instead, what we have to do is collect the garbage, completely free of charge. The landfill is completely free. That's what we get," Emeric complains. "What the Viequenses get is the cleaning of the backyards. That is like when the Navy was there. Identical. You walked around Vieques and saw signs that said 'we do laundry', 'we clean shoes'. That's what we're getting now. But at the administration level, there's nothing," says veteran activist Ismael Guadalupe. Bonilla says that tourism does not bring local benefits. "That's the way it is throughout the Caribbean," adds Bonilla, who has studied other similar processes in this region. In 2000, 60 percent of the population in Vieques was below the poverty line. Today it is 36 percent. But among Americans, only 5.6 percent are poor, which suggests that it is their presence that has led the statistics to drop. Bob Gevinsky, a U.S. real estate agent who has lived here for 12 years and was a hotel manager, believes that tourism is the only economic option in Vieques right now, and maintains that with an educational plan to strengthen the skills of Viequenses they can also benefit. "At the hotel, I needed employees to do office work who spoke English and could handle Microsoft Word, Excel, and the hotel's system. That was basic. It was very difficult to find a Vieques resident with those credentials, unfortunately," says Gevinsky, who acknowledges that land and property prices increased dramatically when the Navy left but assures that they have stabilized. Gevinski said most of the inns on Vieques are owned by Americans who live on the island and invest their money right here. "Just because a business is founded or run by a gringo - I use the word gringo, I'm not offended - that doesn't make it bad. Nor does it mean that they take their profits to the place they came from. They help the Vieques economy and every Viequense who works for them," said Gevinski, a New Yorker whose wife is Puerto Rican. For Gevinski, people use the word “gentrification” in an "irresponsible" fashion. "When a landlord evicts tenants who have lived in their apartments and paid rent responsibly for 20 years to turn it into an Airbnb, that's irresponsible. But if someone buys a destroyed place, fixes it and creates a house where people can live, that's not. That could also be interpreted as gentrification, but it hasn't hurt anyone," adds Gevinski. Actually, there are two more families left where there used to be many. Felícito has also received an offer for his house. He refuses. He knows that if he decides so, in a few weeks, there could be $250,000, $300,000, maybe even more, in his bank account. But that does not motivate him at all. He says goodbye with a strong handshake. Whatever it may be, Vieques, meanwhile, continues to its destination.